The National Library of Ireland is working to make many of its resources available online. There is an impressive range of material already available through their online catalogue. I was browsing through some images recently and came across this print of Francis Higgins (1745?-1802). 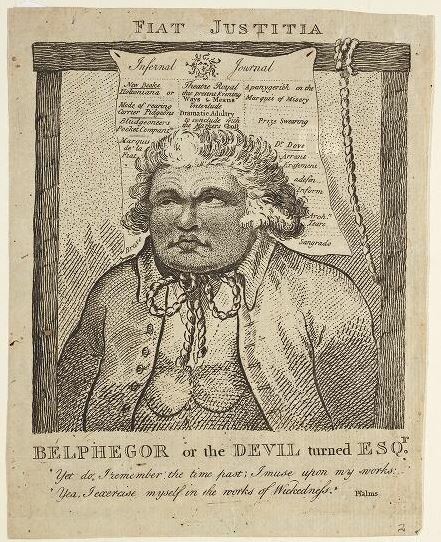 Belphegor or the Devil turn’d Esqr (1802-1810). Higgins had a varied career as an errand boy, ‘shoeblack’, waiter in a porter-house, proprietor of a public house, and a hosier. He became involved with the Freeman’s Journal from the early 1780s and was proprietor of the paper from 1783. Although the Freeman’s Journal had long been associated with the Patriot interest in the Irish parliament, once Higgins became involved with the paper, this began to change. Proclamations and other official notices began appearing in the paper in 1782, but these notices disappeared after an overt attack on the administration appeared in the paper later the same year. Then, shortly after the printer and editors appeared before the House of Commons for publishing offensive paragraphs that tended to ‘create groundless jealousies between the kingdom and Great Britain’ in April 1784, the paper began to profess itself to be ‘impartial’ and government advertisements began to appear in its pages once again. After becoming proprietor of the Freeman’s Journal, Higgin’s began to practise as an attorney and also held a variety of other posts, including deputy coroner of Dublin, under-sheriff and then Justice of the Peace for County Dublin. He is also well known to have provided intelligence on the Unitied Irishmen to Dublin Castle in the late 1790s. When Higgins died in 1802, the Freeman’s Journal was left to one Frances Tracy, possibly his illegitimate daughter. Under the care of Tracy’s husband, Philip Whitfield Harvey, the paper regained some independence from government influence. If you’d like to find out more about Higgins, a (hostile) biography written by W. J. Fitzpatrick entitled The Sham Squire and the informers of 1798 (Dublin, 1866) is available on archive.org. Thomas Bartlett’s 1998 History Ireland article ‘Informers, Informants, & Information’, which provides a great introduction to the intelligence wars of the 1790s, is also openly available online. A post on the history of the Freeman’s Journal by Felix Larkin is available on the NLI Blog here. And a list of further reading on Higgins is available here.